Formula One racing isn’t as popular here in the States as it is in other countries. We have Nascar and that seems to be enough for a lot of people. 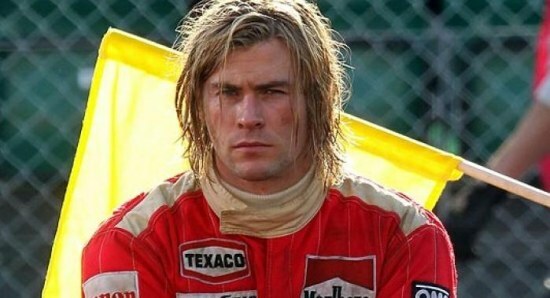 However, the new movie Rush, directed by Ron Howard and starring Chris Hemsworth, just might change people’s minds about Formula One. A new trailer for the film is out today and in it we get all the amazing racing action we would expect. 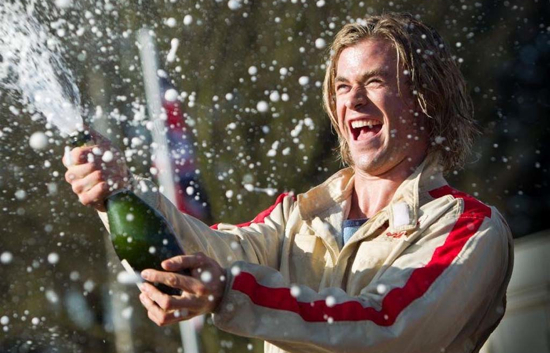 Plus, there’s a lot more of the human drama that chronicles the rivalry between 70’s racing legends James Hunt (Hemsworth) and Niki Lauda (Daniel Bruhl). And what a rivaly it was, back in the days when cars were fast, winning was everything and safety was an afterthought. Also in the film are Olivia Wilde and Alexandra Maria Lara. Look for Rush to arrive on September 27. Look for the trailer, as usual, after the break. Racing is fun. Racing is cool. Who doesn’t like fast cars and action? That’s right, nobody. In fact, we’re pretty interested and very ready to like the upcoming movie Rush featuring Chris Hemsworth and Daniel Brühl. The international trailer for the Formula 1 racing pic dropped today. The two actors star as James Hunt and Niki Lauda, extraordinary rivals who dominated the sport in the 1970s. Peter Morgan wrote the script and Universal has set a September 20 release date. As we have been doing for many months, we’ve got another peek at Activision and Bizarre Creations upcoming Blur Racing game for you today. This time, we go under the hood once again to check out the cars and tracks featured in the game. There are all manner of vehicles from which to choose and the game allows for a great deal of flexibility when pimping your ride. Plus, it also features some pretty amazing race tracks from which to choose that offer a lot of potential for spills, chills and for damage to you and/or your car. Check out the new trailer for what will surely be an awesome addition to your gaming library after the jump. Blur ships on May 25th for Xbox 360, PS3 and PC. Even though we’ve brought you quite a bit of information about Activision and Bizarre Creations Blur racing game already, that doesn’t mean there won’t be anything cool left when the game actually hits stores. We’ve had a lot of screenshots and some trailers and this time around we’ve got another trailer for you. The game offers a first in the racing genre with up to 20 players online at the same time, a progressive ranking system that rewards gamers the more they play, objective based race events, and if that weren’t enough, Blur brings back a fan favorite with 4-player split-screen gameplay. Sounds cool, right? Yeah, we think so too. Besides, isn’t most everything better in a group? Check out the trailer featuring all the hot multiplayer action after the jump. Blur will be available this spring for Xbox 360, PS3 and PC. We’ve been following Activision and Bizarre Creations’ upcoming racing game Blur for some time now and each time we get more info, a trailer or other items, we get more interested in the game. This time is no exception. Today, we’ve got another trailer for the game which takes things in a more social direction. In the video, the Bizarre Creations team discusses the social gameplay aspects of the game, including how the game brings people together — except maybe when seeking serious revenge on your opponent. Yes, those things happen. Also, our friends at Activision wanted us to remind you that the Blur multiplayer beta launches in March. So mark that date on your calendars. We’ll have more details on that for you when we get them. In the meantime, click on through to the other side to check out the brand new trailer. It may not be as obvious as our love for movies, TV or comics, but we do love video games around here as well. One of the companies we frequently seems to purchase games from is Activision. Their titles, including the Call of Duty and Guitar Hero franchises, are among the most fun and most successful out there. Another one of their games that looks to be pretty great as wels is the upcoming Blur racing game. We’ve had trailers and screenshots from the game previously and now we’ve got another trailer for the game to share with you today. In this one, Activision takes you under the hood and features the Bizarre Creations development team, who created the game for publisher Activision, discussing Blur’s storyline, unique driving styles, impressive stunts and more. In case you haven’t been following our coverage of the game before, Blur is, according to Activision: “the ultimate powered-up racing experience, dropping players into heart-pumping, electrified action with multiple cars trading paint as they charge towards the finish line.” Does that sound like fun, or what? Blur will be available this spring for Xbox 360, PS3 and PC. Until then, check out this latest trailer after, you guessed it, the jump. Activision and Bizarre Creations’ Blur racing game has inspired some great trailers so far, and this latest one is no exception. This time around, we get a lot more “fastrack” gameplay but also, as in the past, a pretty funny story to go along with it. Yes, I realize that’s a lot of quotes but sometimes, believe it or not, press releases really do contain valuable information. This just happens to be one of those times, but don’t get used to it. Click through to check out the new trailer. Blur hits store shelves soon. We’ve been tracking Activision and Bizarre Creations’ Blur racing game for some time here at The Flickcast. As its release draws nearer, we’re even more eager to get a chance to play it — especially when we see new trailers for the game like we have for you today. In the past the company has delivered some rather inspired videos to get you in the mood for some extreme racing action. This time is no exception. “Blur is the ultimate powered-up racing experience, dropping players into heart-pumping, electrified action with multiple cars trading paint as they charge towards the finish line. Drivers careen through real-world track locations packed with fast curves, sneaky alternate routes and hair-raising jumps in over 50 licensed cars as they collect intense Power-ups, including the ability to blast other cars out of the way with huge bursts of energy, boost their speed, and more.” I know, right? Click through to check out the new trailer. Blur hits store shelves later this year.